I happened upon Telltale games when I first received my iPad about two years ago, and fell in love with the company. 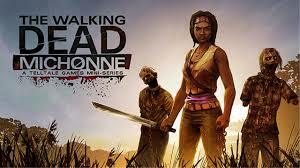 The first game I played was The Walking Dead Season 1 and 2 (still waiting on season three guys!) and I feel in love with the they mixed a compelling movie like story that played like a action and Choose Your Own Adventure game. 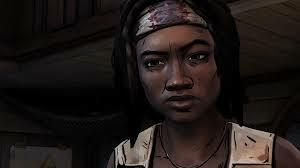 In this series, we play a through a story that is based on the comic version of the much beloved Walking Dead character Michone. This presents us with a new side of our beloved character and immerses us during a time that Michone leaves Ricks group to go and figure out some stuff by herself. Right from the opening scene, you are thrown right into her world. Michone is fighting the demons of her past whilst fighting the zombies in her present, combining both flashbacks and present day circumstances in a truly remarkable opening to any game I have played in recent months. The game-play does include some combat, which you can navigate with prompts telling you which button to push at what time and for how long (yes your fingers will get tired), but that is not what this game is truly about. TellTale Games is all about the story, the combat is really just an additive. The choices you make are the actual game-play, and the way you make the character react during high tension, and low moments builds her character in the game and then effects the way that other characters will interact with her during the course of the episode. These decisions will carry on to the next episodes as well so choose wisely! Now here come some Spoilers- Michone is clearly not over the deaths of her two children, who she is having chilling visions of on and off during the first episode. She is found by her new "friend" Pete with a gun to her head, to which you can choose or choose not to try and fire. From there- she is brought onto his boat and works with his crew to try and survive. The best part of this sea fairing environment is the water logged zombies. Yeap, the walkers need no lungs and therefore have no problem bringing you under the water and trying to get a bite out of you there- I LOVED that scene. Pete and Michone go to what they think is an abandoned vessel where they heard someone calling out on the radio for help, and to look for some pieces to help repair their now broken vessel. Unfortunately for them they get mixed up in some sort of Water Pirate turf war, and the leader Norma is not too keen on believing that them being there was just a coincidence. The end of this episode leaves you wondering how they will ever get out of Norma’s grasp! This game is everything I expected. It had a great story line that was executed brilliantly, the graphics where amazing, and the sound track equally so. TellTale did a great job of sucking you into the game and keeping you on your toes while you wait for the next episode which I cannot wait to play! Episode One and Two are ready to Play, the finale will be coming out soon!